Newsflash…Children cause pain and suffering. A couple of weeks ago, I did a favor job setting up a kid’s day camp. Which was fine – it’s good for the delinquents to get off the street, and I got grocery money. The only problem is that part of the job was lifting some fairly heavy boxes (unassembled bookshelves, mainly). Which was also fine, except that my partner in said lifting was a 17-year-old camp counselor who didn’t understand how to do things like communicate with a partner, or keep hanging on when asked to. I can’t even be mad about it. I’ve had more years than I care to admit to learn to do this stuff without killing my partner. All of us who do this sort of thing for a living develop the understanding of how to work with a partner – how to communicate, how to read body language, how to walk backwards while carrying a slippery dimmer pack up equally slippery stairs, how to NOT LET GO. But we all remember the day when we didn’t know it. Just like the kid. And the feeling that one gets when one hurts a co-worker is terrible. So yelling wouldn’t have done anything other than crush Junior’s tender spirit. 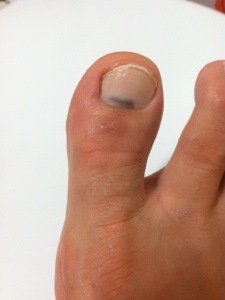 Lucky for me, the toe’s not broken, it’s just… horrible. And kind of throbbing, but I’m so grossed out by the idea of stabbing it with a needle that I’m just going to tough it out. No sandals for me this summer! Or, toenail polish, which I don’t normally wear, but I’m sure it’s better than the black blob. Today was our last day in our ‘hero’ house, so we had, in addition to the day’s work, some scenes to re-shoot (one because the producers didn’t think our stunningly beautiful lead actress looked ‘pretty enough’), and about a million inserts. The call sheet looked like a Tolstoy novel before editing, and we all knew it was going to be a long day – even if they wrapped on time, we still had to load our truck. In the rain, of course, because why wouldn’t it be raining on the day we had to clean up and load our truck? After they finally called wrap – at the last minute before the producer stomped on set and pulled the plug, because why wouldn’t they use every minute they had to finish the massive call sheet – we were cleaning out the house, happy to be done with the place, but trying to work as quickly as we could as the siren call of home and a hot shower was too much to resist. The homeowner had thoughtfully provided wooden ramps so we could wheel carts up the low stairs into the house, as I was carrying one of the aforementioned tweenies down the ramp, I slipped on the wet wood and landed right on my knee. Of course. If I’m going to get hurt at work, why wouldn’t it be right at wrap when my co-workers really need me? I’m told I screamed like a girl when it happened, although I have no such recollection. Our medic iced the knee, gave me some painkillers and some paperwork to fill out (in that order. Hope I did it right), then wrapped it (the knee, not the paperwork) so it would hold weight and I hobbled out to help load the carts. One of my co-workers had slipped on the same ramp a few hours before and injured the opposite leg, so we joked that between us we made one complete electrician. I’m icing the knee now in the hopes that the swelling will go down – I’m officially in 10 hour turnaround (the elapsed time between when one is dismissed for the day and when one must report back to work the next day), so I can’t ice for too long. That sleep thing needs to happen. Tomorrow’s work is in a hospital, so if the knee really hurts I know where there will be a doctor or three. We closed the doors of our truck at 11:00 pm. 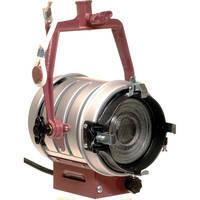 *The tweenie is one of the workhorses of the lighting department. It’s a 650 watt light that’s small enough to hide easily, but puts out a nice amount of light, and no matter how many of them we order, it’s never enough. Why I can’t type right now. Most awesome screwgun accident, ever. Hopefully, the giant mummy-wrapped thumb will be better in a few days.